Join Jasper the Mule and all his friends on adventures filled with lessons, laughter and fun! Appropriate for little buckaroos of any age. When Jasper and his human family head up to Bald Mountain for a picnic to celebrate Valentine’s Day, Jasper gets a crash course in love. The picnic is a special one for Ben and Kylie. Ben has decided to share with Kylie some memories of her mother, who passed away when Kylie was little. As father and daughter bond, the animals are having their own adventures. Moxie is at it again, heading into the woods for some very messy hijinks. Meanwhile, Jasper discovers a big surprise that changes everything and gives him a true understanding of the holiday – his very own beautiful Valentine mule! Available with English captions. Includes special feature The Making of Happy Valley Ranch Diorama - learn how the artists create a miniature world to help the animators visualize the cartoon! Presents disappear, mysterious strangers appear and friends go missing. But junior detectives Jasper and Moxie are on the case. With the clock ticking, Jasper has to use his “mule smarts” to tackle this puzzle of a mystery and put the pieces together before the big parade. But will he solve the mystery in time? Includes special feature The Making of Jasper A Christmas Caper - learn how the Jasper stories go from book to animation! When they make a new friend who is lost and alone, Jasper’s mule-y sense of loyalty kicks in and he is determined to help, no matter what. Will Jasper and Moxie save the day? Will their new friend find his “forever home?” All the fun and warmth of Thanksgiving come to life in Jasper: A Turkey Tale. Includes special feature The Making of Jasper: Animation - learn how the artists get inspiration and animate Jasper and his friends! Young Jasper the mule learns life lessons about friendship and love in the very first installment of the Jasper series. Appropriate for all ages! It’s the Fourth of July and a big celebration is brewing at Happy Valley Ranch, but Jasper the Mule is puzzled. “How can a country have a birthday?” he asks. With the help of Moxie the Dog and the rest of his friends, Jasper learns how our country’s forefathers worked hard to build America into the great land it is today. Being a true mule, Jasper is feeling pretty independent himself! So with Moxie in tow, he decides to take a trip up to his human family’s house, where a Fourth of July barbecue and pool party is in full swing. Jasper becomes the ultimate “party crasher,” as he quickly finds out that mules and pools don’t mix and that freedom comes with responsibilities. A day full of hijinks, laughter and great music by Grammy®-winning Western band, Riders in the Sky, turns into a wonder-filled night, as the sky comes alive with fireworks and Jasper and his friends celebrate the beauty and the splendor of our country’s birth. Includes special feature The Making of Jasper: Foley - learn how sound makes the Jasper cartoons come alive! Animated character Jasper the Mule wants more than anything to compete at Bishop Mule Days in Bishop, California, but he doesn’t think he’s got what it takes. One morning, he discovers he’s been magically transported into the real world, and he sets off for Bishop Mule Days. Along the way, Jasper meets some very funny and helpful people. He finally makes it to Bishop and meets beautiful champion competing mule, Peepers. When Peepers is injured, Jasper must take her place. Will he find his courage and save the day? Find out in Jasper Goes to Bishop! 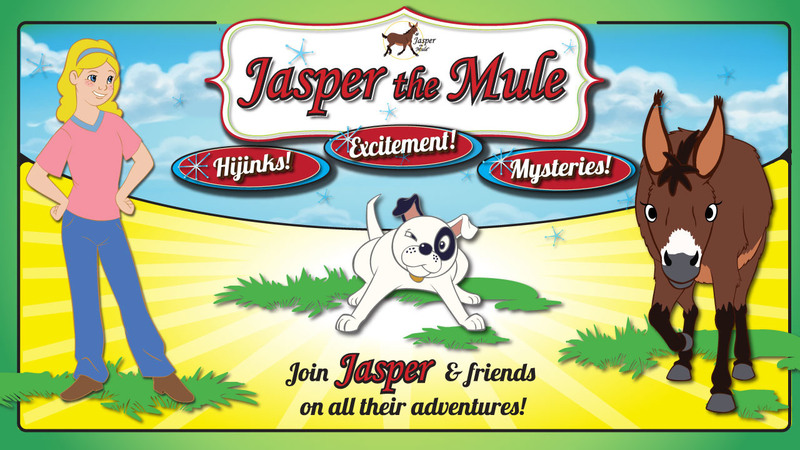 In Meredith Hodges’ award-winning animated series, a young mule named Jasper, along with his best friend, Moxie the Dog, and the rest of the gang, have a series of adventures packed with excitement, laughs, mysteries and plenty of fun! Each of the Jasper the Mule animated episodes teaches a valuable life lesson while supplying non-stop fun and adventure the whole family can enjoy. Watch all six episodes and get the special features! Suitable for all ages. Ever wondered how animation is made? Go behind the scenes in four short films and find out! You'll see how Jasper's world is created in miniature first, how the artists get inspiration to animate the characters, how important music is and how all those crazy sound effects are made.